We met our Reading Goal!!! Masai and I by: Virginia Kroll – This was a great comparison and contrast style story written from a young girl’s view point. It was an excellent way to introduce the Masai and their culture. Bringing the Rain to Kapiti Plain by: Verna Aardema – This was a folk tale style story about well bringing the rain to the Kapiti Plain. It ended up being a stretch for Cricket to follow what seemed to be a realistic tale into the folk style of things. I also felt the ever growing yet completely repetitious tale was monotonous. Charlie the Ranch Dog by Ree Drummond – I ADORED this book. The basset hound was absolutely adorable as a character and the drawings were excellent. Cricket enjoyed the story as well, and I would personally love to add this book to our personal collection. Whoo’s There? : A Bedtime Shadow Book – This is not so much a story book as an experience or activity book. Cricket loves to look at the flashlight pictures though and talk about the images. It’s a fantastic concept. Sunset of the Sabertooth (Magic Tree House, No. 7) – As I have said before Cricket is in love with the Magic Tree House books, and we were thrilled to finally get our hands on book number 7. I am always impressed with how well Cricket keeps up with the story, how engaged she is when we are reading, and her insight into the books. Cricket really liked the wooly mammoth in this book and other elements of the ice age tale. That makes 201 books total so far for 2011. WOOHOO!!! We surpassed our 200 book goal, but we will continue reading through the year of course. I highly recommend joining in at the Read to Me Picture Book Challenge. 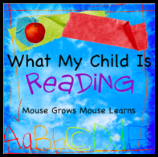 You should also see what others are reading this week at Mouse Grows Mouse Learns. Cricket did amazing this week. She actually read these three of the four sentence searches all by herself to me, and repeated the work for her Dad and Mimi. I was so proud of her it actually made me tear up. Horizons is putting more and more addition and other more difficult work into the book, and Cricket is taking most of it in stride. She did awesome with the addition this week. The only thing that threw her was that in a lesson while we were working on counting by tens they threw in ten dollar bills. This was my first dislike for Horizons. They have gradually introduced pennies, nickles, and dimes, their worth, and how to write cent amounts. We have not worked on dollar amounts at all yet though and there was really no explanation of it. It was just expected that you knew it’s worth and how to write it. This week we began our journey into Africa with a study of Kenya. Once again we actually had a people around the world image up on our wall for Kenya. Cricket enjoys having this connection, and she was really excited about starting a new continent. To kick things off we did this continent hop from Spell Outloud. It was good exposure to all the continent names, and Cricket enjoyed the game aspect of it. Cricket recognized saying Jambo for hello from Dora, so this clicked with her well. She did a decent job this week of copying the Kenya flag and not getting “creative”. This week we were finally able to enjoy our newly rebuilt deck, and Cricket spent time out there observing the change in weather. She really enjoyed collecting and comparing leaves. We also really enjoyed just being able to open the door and observe the weather for our tracking sheet. This week Cricket did a string art project, and I was reminded yet again that my princess is not a fan of the messy. She enjoyed putting the yarn on paper and the final result, but she did not like pulling the paint soaked yarn out of the paper. I used tempera paint, and I wished I used a better paint because the colors didn’t mix or blend as well as I would have liked them to. Our calendar work is going really well and Cricket is grasping days of the week well. She does best when associating each day with an activity. Cricket is really enjoying the resources from 1+1+1=1 and things are starting to click for her. I think bingo was her favorite this week. She does a great job reading the words for this fun game, without realizing she’s working on something. We continued our Horizons work and we also finished up our September weather graph and discussed it. I talked to her about how to read the graph and compared the results. She reported the most common and least common types of weather we had. Cricket has done really well with our journey to South America, and I have loved the resources from Expedition Earth. This week we studied Argentina and Cricket was tickled that we were finally studying one of the people from around the world on our wall. Here is a look at our country info that I had out for her this week. We also did a couple of puzzles this week as we wrapped up our South America study. 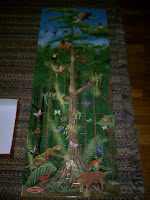 Mimi gave us both of these puzzles (thank you). 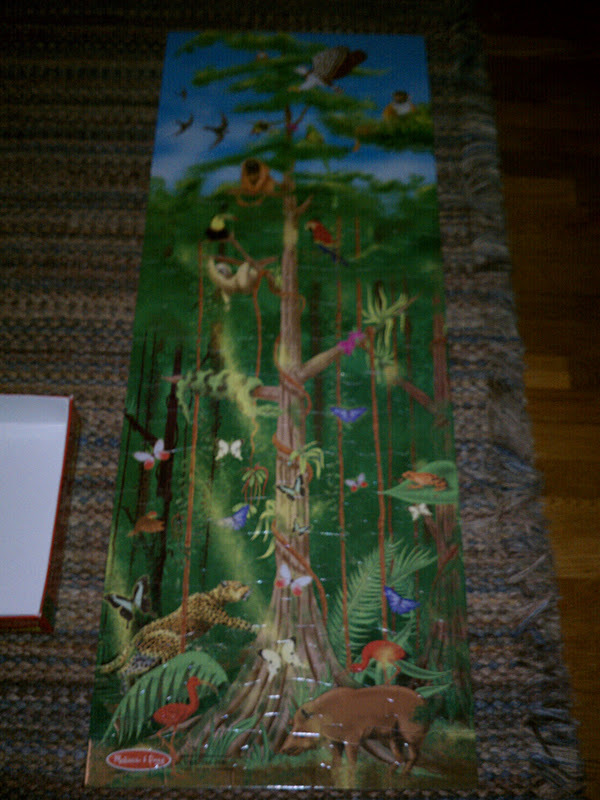 One is a great Melissa and Doug Rain Forest puzzle, and the other one is a book of puzzles we did the South America puzzle. After the library we made a mini trip to the Master Gardener’s vegetable garden. 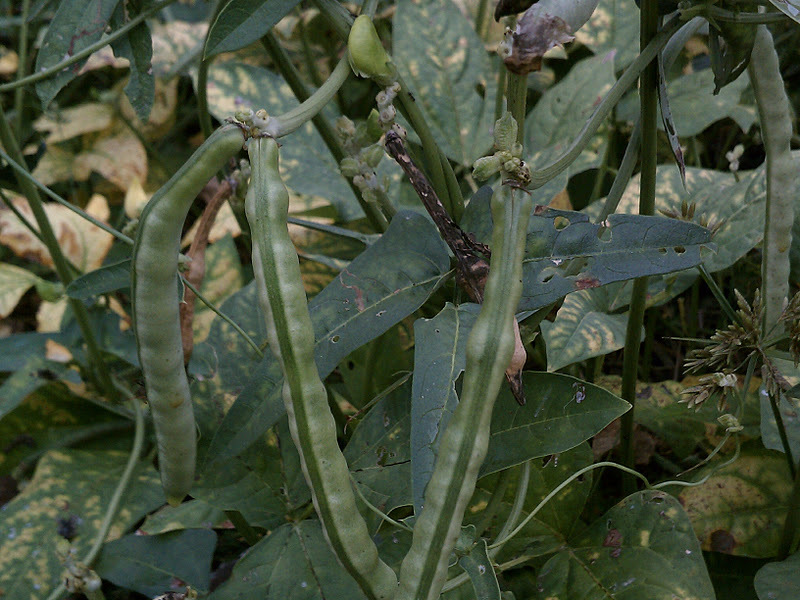 Cricket loves wandering through and observing the different types of plants and vegetables. She even did a pretty good job of classifying them this time. I was really surprised by how many she knew. Cricket did several small art project this week. This is definitely a weakness of mine, but I’m desperately trying to feed her interest. I introduced a new art supply, oil pastels, and they went over pretty well. I used them for my sample art project, but she chose to use markers instead. The abstract drawing ended up being sort of a flop overall though. Cricket preferred this color mixing project, but miss perfection wanted lots of help with it. She had me outline the whole thing so she wouldn’t go outside the lines. Cricket continues with her gymnastics and is progressing in her skills. She has a new love though! She is super excited about ballet so far, and I adore watching her. Shark vs. Train by Chris Barton – Cricket LOVED this book, and the silliness of it. I loved how it cleverly differentiated tasks each would succeed at as well as tasks both would fail at. We both enjoyed how imagination was met with realism at the end of the book. CookieBot! : A Harry and Horsie Adventure by Katie Van Camp – The librarian read this at story time a couple of weeks ago, and we’ve been trying to get our hands on it ever sense. Cricket asked for this book to be read over and over again while we had it, and was very sorry to return it to the library. I would call that a hit. 999 Tadpoles by Ken Kimura – This was an interesting tale of a mother and father frog having to move their 999 baby frogs to a new pond once the grew out of the tadpole stage and were taking up too much room. Cricket liked the drawings and all the different animals in the book. Fancy Nancy: Stellar Stargazer! by Jane O’Connor – Fancy Nancy books are always a hit in our house. Cricket enjoys the stories and I love the language development. This was by far my favorite so far though. I really liked how the stars were introduced, and think it would be a great add on for an outer space unit. BRAVE LITTLE TAILOR (Disney’s Wonderful World of Reading) – This is one of Cricket’s new favorites, I think because it was presented with characters that she knows and loves. The book was a good adaptation of the story, if I remember it correctly. That makes 196 books total so far for 2011. I’m almost at my 200 book goal! I highly recommend joining in at the Read to Me Picture Book Challenge. I love that we can take a vacation and work in field trip style learning. It’s such a win win situation. We do our normal school routine Monday thru Wednesday and took our school on the road for the rest of the week. Cricket is really progressing with her reading, and I have enjoyed using Teach Your Child to Read in 100 Easy Lessons with her. Cricket is getting better at following directions and staying in the lines, but she’s also throwing in her own flair! Cricket is still steadily progressing with her Kindergarten level math, and we are both pleased with the mix Horizons provides. The visualization and different colors helped Cricket with counting more consistently. We choose not to focus on a country this week, but instead we explored a different region on our vacation. While visiting the Great Smoky Mountains in Tennessee we covered mountain ranges, animals of the area, a little history, and reviewed “me on a map” as we returned home. Cricket was beyond thrilled that we got to see a couple of bears, and while hiking in Cades Cove to the Elijah Oliver place we got to see a small herd of deer. Cricket observing the deer with Daddy (one of the deer is far right). Also during our trip we went to the Tennessee Aquarium, and Cricket fell in love…with the sharks. We ended up spending a long time at the shark tanks at her request and even caught a great scuba diver led educational segment. In addition, to observing all the incredible fish she was able to pet a sturgeon, identify and observe butterflies, and learn about the architecture of turtle shells. We all had a really enjoyable and educational day. As a bonus, Cricket was super excited to see the blue dart frog that we had just learned about in Expedition Earth. Cricket is still in love with painting. She chose to waterpaint her u is for unicorn page. I got these super cute letter pages from Flipflops and Applesauce. She has really enjoyed all of these so far, and I am just letting her pick the letter she wants to do each week. She also free painted a rainbow and I loved her color mixing that she did. I only gave her primary colors for this. In addition to walking the entire aquarium by herself Cricket also hiked with us some in the Great Smoky Mountains. I was super impressed by her endurance and enjoyment of all the activity. We also went to play putt-putt together for the first time. Cricket enjoyed herself, but she wasn’t at all focused on the task at hand. she typically did decent with her initial shot at each hole, and then it would just all fall apart. I don’t think there will be any golf dates with Papa in her future though. I did a bad job tracking what we read this week, but here’s what I remember. Say Hola to Spanish by Elya – This was a decent combination of vocabulary and “story”. It did a good job of cleverly capturing the pictures on each page and providing the Spanish words in meaningful and fun ways. Porcupining: A Prickly Love Story – Cricket adored this sweet love story. I had a hard time finding the tune for the song, but I also enjoyed the cleverness of the overall story. Also the porcupine did “end up with” a different species and I found this odd. That makes 191 books total so far for 2011. I highly recommend joining in at the Read to Me Picture Book Challenge. Cricket really enjoyed herself this week, and we got a lot done especially considering we were playing catch up from last week. Cricket seems to be learning and expanding her vocabulary more. This is what happened when I left Cricket alone to complete her funny fonts worksheet. Good work with some added pizazz. Cricket continues to work steadily though the Horizons workbook. I am also tying in other resources that we have when available. She really loves this clock from Learning Resources. This week in Expedition Earth we were studying Peru. Cricket is doing better than I expected with the mapping, but she’s having difficult with pronunciation. So if I ask her to find a specific country we studied she can point to it, but she can’t (or won’t) look at the same map and identify the country to me. She really loves doing the flag now that I let her paint it. Cricket loved our art project for this week, and I loved seeing the click in her head. Our painting assignment this week was a symmetry project. I folded a paper in half and gave Cricket the three primary paints. I told her she could paint whatever she wanted on the one side of the paper. My girl, she painted stripes! Luckily she used enough paint and painted close enough that when I folded it over some of the colors blended. When I opened the paper and she saw the change and how the colors blended she loved it. She immediately pointed out the secondary colors and how they were made. It was better than any presentation I could have given her. Cricket has finally started ballet and I think she loves it. She loves telling us all about it and showing us what she learned each week. She also continues to do Super Crickets, and grow there. I added a new technology to our school routine this week. Cricket loves using her daddy’s tablet so I am taking advantage and this week we used programs on sign language and handwriting.